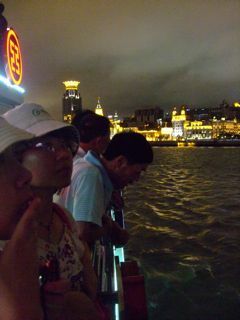 For my last night in Shanghai I decided to do a river tour. It was quite an experience. First I went to the ticket office by the riverside. There were three women there, all highly animated and, to be honest, a little on the wired, frantic side, it seemed to me. They said the next cruise would leave at 8.30pm, which at the time was 40 minutes away so I figured there was no great rush, and took myself off for a little walk to people-watch awhile. This was a mistake, because when I returned, just after 8pm, that cruise was no longer available and I had to settled for the 9pm departure. Then it turned out that a 9pm boat departure meant an 8.15pm queuing time as it apparently takes 45 minutes to get everyone on to the boat. That explains why the women had seemed so stressed and hurried when I first went into the office and they wanted to sell me the 8.30pm ticket. I’d obviously have had to rush if I’d wanted to be on that boat. 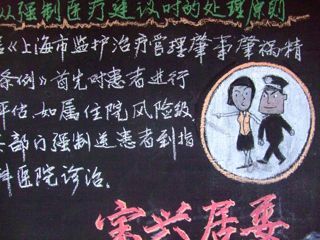 They probably explained this to me as soon as I walked in the office, but seeing as it would have been in Chinese, I didn’t understand it. No matter. I was the first in the queue for the 8.15 departure. It turned out to be the first of many queues that night, and each of those queues was accompanied by such a bristling, bustling, excited sense of anticipation. “Man, we are so excited to be going on this tour!” is what I imagined they were all saying to each other. First we had to line up along the wall of the ticket office, and have out tickets checked. Then a man with a little flag walked us across the road, and led us to a big coach. 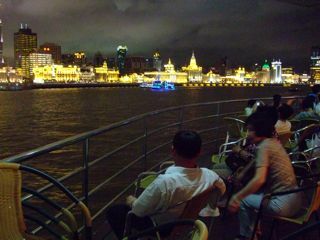 We climbed aboard, and were driven about ten minutes down the road, to what turned out to be the main Shanghai docks. 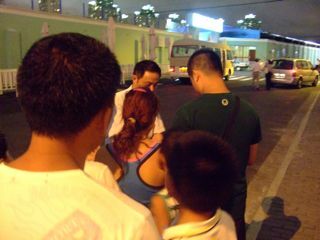 We were dropped off at a street corner, everyone squeezed their way impatiently off the bus, and made another line. The same people kept pushing their way to the front of each line. The same excited energy filled the air. The man with the tour guide flag made an announcement to everyone, then he approached me (the only whitey in the group) and surreptitiously showed me a handwritten note. “Keep going straight ahead. We will board the boat at Dock 5”, it said. I had to laugh, because it was all so thoroughly organised, and so contained, and yet this was a group that simply didn’t want to be contained. 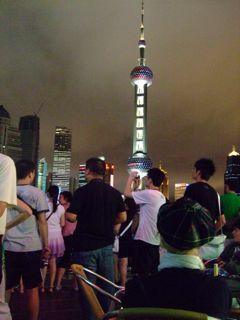 then at the top they flung themselves at the barriers and started to exclaim at the sight of the Pudong and the Bund all lit up, and got out their cameras. Once at the top there was nowhere else to run to. If you wanted to enjoy the cruise from a plum position (for example, on the birds nest upper deck, or sitting in chairs around the bow of the boat, you had to pay the attendant money. No extra tickets were issued, it was purely cash in hand. 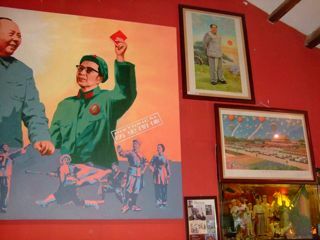 It all looked a bit unofficial and not very communist. Then again, maybe a black market in premium views is very communist. 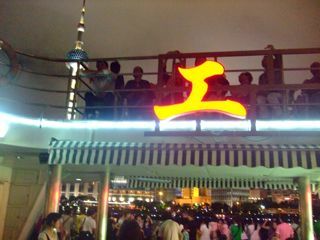 In any case, I stayed with the proletariat and watched them photograph each other against the illuminated changing backdrop of lit-up skyscrapers (Pudong) and lit-up Art Deco (Bund). There were chairs set out on the main deck but it turned out that if you wanted to sit in these you had to buy something from the cafe. Nobody wanted to buy anything – we were all too damn excited about being on this boat! There really wasn’t much else for sale there. 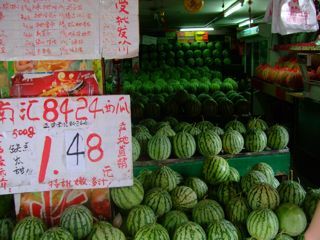 Watermelons on every shelf, piled high. I loved this sign, and waited in anticipation to see people following it. They didn’t. 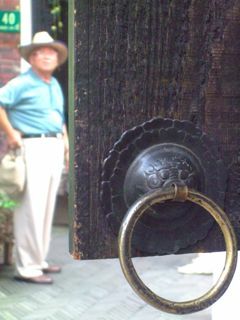 I liked framing this picture of an ornate door handle. I tried to redo the focus so that the man was in focus, but he moved before I could get the shot. 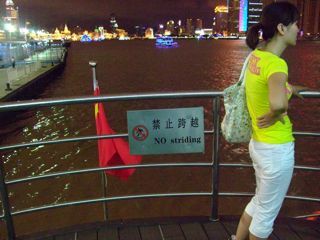 This was taken today at the Taikang arts precinct. 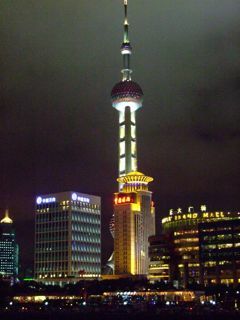 I spent my second day in Shanghai exploring further. I set off first to find the Train Ticket Office, located (according to the staff at my hotel) in the pedestrian shopping mall on Nanjing Road East, where it intersects with Central Zheijiang Road. 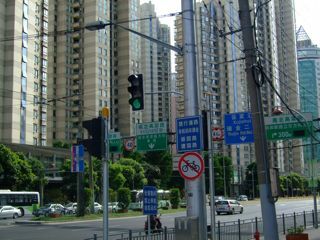 Walk out of the hotel to the main road, turn right, then turn into the third street on the left, then keep walking until you get to Nanjing and look for a little window in a wall somewhere. 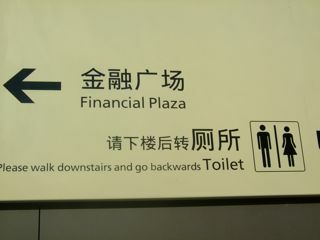 Armed with the words “train ticket office” written down in Chinese, I got going. 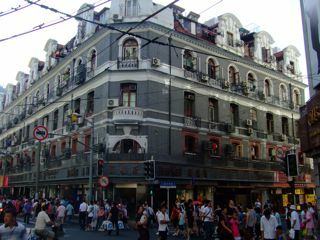 Central Zheijiang St proved to be a great street, filled with interesting local shops. 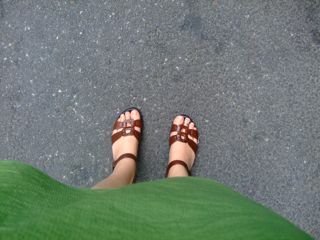 I wandered into a shoe shop and came out with new sandals. The woman guessed my size exactly (and was suitably pleased with herself). They were so comfortable, I wore them the whole day with not a blister to complain of! My eyes are constantly gazing upwards, marveling at the beautiful Art Deco architecture. I was struck by the Gotham City quality of one building – it reminded me of the Russell St Police Headquarters in Melbourne (these days a block of apartments). The Train Ticket Office turned out to be a window at the front of this building. Next I took the metro to South Shaanxi Road, and walked from there into the French Concession district, a leafy residential/embassy area where plane trees cover the streets with lush green canopies. I enjoyed being out of the sun’s reach for a while. There are lots of interesting shops, galleries and cafes in this area. However, I stopped for lunch in a canteen-style coffee shop where the only English I could see was in a NO SMOKING sign, and the words PUSH and PULL on the door. The food was plentiful and all on display. I could point to what I wanted, and was delighted with my selection – broccoli, eggplants, mushrooms, some cabbage (I think) and rice. Finally a more balanced proportion of the five food groups. And for a bargain price. While I was eating, it suddenly started to rain. How serendipitous, I thought – not only have found such a great place to eat, but to have found it and be eating right when the downpour started! Next I went to the Taikang Road arts precinct, which was packed with visitors. It’s an interesting array of shops selling silk scarves, hand crafts, paintings and photographs, leather goods. I stopped for coffee at Kommune, where I paid nearly twice the cost of my lunch for an iced coffee. Everything balances up in the end, doesn’t it? 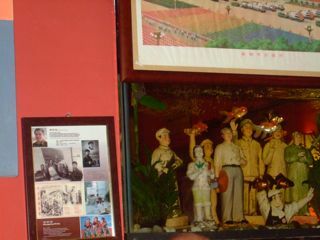 Kommune has reproductions of Mao-era propaganda posters on its walls, and I particularly loved seeing the Mao figurines in the fishtank. 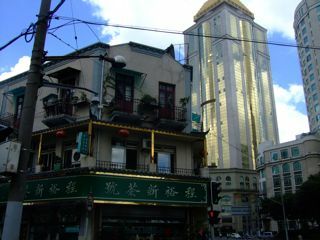 I exited the arts precinct and within just a few footsteps found I had left the French Concession district behind me. I walked to the nearest Metro station (which wasn’t that near), navigating my way through an interchange without incident. In some of the trains they have TV screens and I particularly like it when they show a program about the DOs and DON’Ts of using the Shanghai metro system. The program is hosted by a handsome man with an endearing dimple in his right cheek and a flirty smile. I could imagine him in an ad for Mac products – cheeky, smart, little bit playful and arch. Yesterday’s program showed impatient business men doing things like pulling the Emergency cord, or trying to force the doors open, with a great big red X slamming down on top of the image. Then they show a similar man sighing, and making a call on a mobile phone – big green TICK for him. The key message here? If you are running late, or miss your stop, don’t try and disrupt the entire train service, make a call and tell whoever you’re meeting that you’ll be a bit late. Today’s episode was about finding unattended luggage. A group of teenage girls is walking along the platform. One trips over a small black wheelie bag. Oh! she says, and she and her friends gather around the bag and open it up (presumably to find out who it belongs to). WRONG! says Dimple Man. In the next scene we see the same group of girls walking with two men in uniforms and pointing out the bag. The two men approach the bag and cover it with a blanket. RIGHT! says Dimple Man. Sweetheart. There is another ad in this vein which is a cartoon. A sullen, round-shouldered character is lugging a kind of sack over his shoulder. He avoids the bag screening x-ray machine that everyone is supposed to put their bags through when entering the Metro system. (“For everyone’s safety” the signs on the machines remind us). There is a woman (with better posture) who has a smart red-and-white tote bag, and she puts it through the machine. Then the security guards go up to the round-shouldered person and ask to see his bag. They empty the contents out and – I’m not sure what it’s supposed to contain, but I think they find items for making bombs. And then they take the man away and he looks even more sullen and hang-dog than ever. I enjoy this existence where I can’t speak the language. I am reduced to deciphering and guessing, and filling in the gaps from my own imagination. It’s what my students at Language School have to do all the time, of course. Here I get to do it while being entertained by a completely different style of visual communication, which amuses me no end. I am in China this week and next, here for the ISME [International Society of Music Educators] biennial conference. First I will be at the Community Music Activity Commission, which meets this coming week in Hangzhou, then in Beijing the following week for the main International Congress. I’m presenting papers at both events, looking at the strategies I’ve developed for developing creative music and composition in ESL classrooms. Hangzhou is only 2 hours by train from Shanghai, so I decided to arrive a few days early and be a tourist. 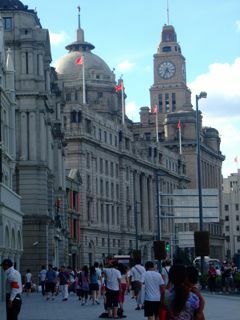 Yesterday I walked around the Bund, found my bearings somewhat and admired the heritage architecture. 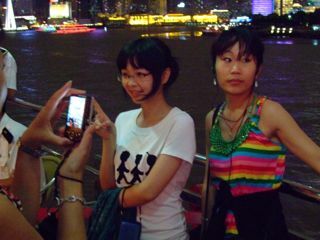 There were many, many local tourists (as in, Chinese, not foreigners) who were suitably agog at the sights. 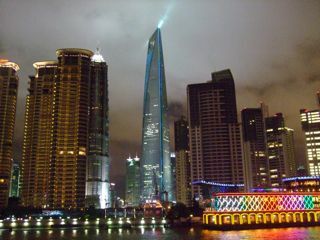 The view across the river to the newer Pudong district is filled with space-age skyscrapers. I kept passing groups of out-of-towners resting in the shade, their shoes off. But you won’t see them in the photo below – I feel rude if I point my camera at specific people. I liked the red flags at the top of this building – in the afternoon sun they had a sharpness to them which the photo below doesn’t really do justice to. I wandered into some alleyways. Lots of these have signs at the entrance, suggesting there are businesses and shops inside that members of the public can go to. The couple that I walked through had blue and green plastic exercise equipment near either entrance, a kind of home-gym opportunity to encourage people to keep fit, presumably. 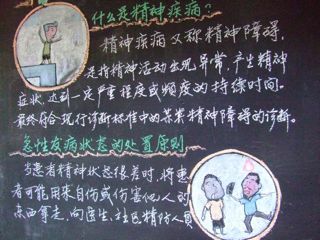 There were chalkboards with what seemed to be community service announcements on them, accompanied by colourful cartoon drawings. They were written in chalk, and could have been rubbed off at anytime. This one explains (I think) that if people are engaging in obnoxious behaviour, sensible citizens should go and get someone in authority to sort it out. 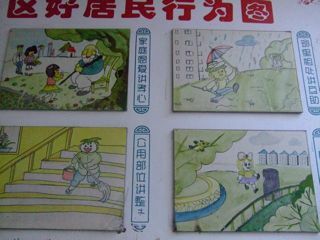 This last set of pictures were more for children, reminding them to do helpful things like pick up rubbish and put it in the bin. Certainly Shanghai is a very clean city, with the footpaths and roads clear of rubbish. Unlike Paris, which will forever retain the Premier Prix in my mind for street filth. There, I had to keep my eyes on the road because of the steaming mounds of dog poo that seemed to be deposited every hundred metres or so. 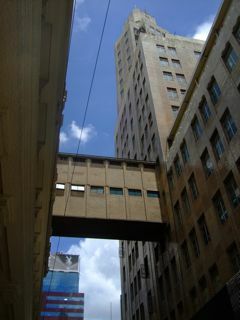 Here, happily, it is safe to gaze upwards at the beautiful buildings and wander without sidestepping. Sometimes it can be really hard to teach the students at Pelican Primary. They don’t always listen – they don’t always remember to listen, and they also get distracted easily. Many of them have lived their whole lives surrounded by a certain amount of constant chaos, I would say. It’s not an environment that encourages calm focus as a matter of course. There is also a high number of English Language Learners (EAL/ESL) students in the school – some are new arrivals, others have only started learning English when they started school. Therefore part of this tendency towards distraction may also be caused by the weariness that comes from constantly needing to process and decipher unfamiliar language. I sense too, that the kids who can focus, get fed up with waiting for everyone else so they switch off too. I’ve been working in this kind of environment for some years now, so I have some strategies that I feel are very effective for teaching musical principles and disciplines through environmental and implicit means,rather than explicit instruction. However, there are limitations on what can be explained or taught in this way, and there are definitely some days where I go home feeling weary, and bothered by the sense that I didn’t really teach anyone anything that day. I didn’t challenge or extend any of those who are dying to be challenged, and I didn’t sufficiently engage those other students who need to be given sparks to motivate them to latch onto something. Therefore, the days when I do get the chance to explain something, to teach them, are exciting – thrilling, even! Last week, I played a game with the 4/5 class, where we try to count the numbers 1-10 in order. Anyone can say any one of the numbers, but if more than one person says a number we have to go back to 1 and try again. It’s a simple enough game but quite tricky to realise, and they love it. That particular week we had some time, and we had good focus from everyone, so were able to dig into the game more deeply. We observed and discussed patterns and tendencies that individuals have. We talked about competitiveness, and the way some voices constantly take the initiative, come to the fore (but in doing so can take space away from the others in the group). We experimented with taking some of the more dominant characters out of the mix – not as a punishment, but just to see what happened in the game if those people weren’t involved. The whole game lasted for about fifteen minutes and as I looked around the class I could see thoughtful, engaged faces, puzzling over the notions of teamwork and ensemble that arise in this game, and the skills inherent in ‘making space’ for others. After the class their teacher told me that she’d also been fascinated by the way they played the game that day. “All those issues that were arising and getting discussed are issues that play out among them on a daily basis,” she said. “Who goes first, who has to talk over the top of others, who has to make sure their voice is heard first giving the answer to something, ever when everyone knows they know…” Perhaps this prior awareness was one of the reasons their engagement was so strong. It was satisfying to be able to facilitate them grabbing hold of a problem and nutting it out in a positive, solution-focused way, that meant that they could learn from the experience, and be changed in some way by it. This is the second year that Tiny and I have taken a week’s winter beach holiday down at Sandy Point. We choose a house to rent for the week (open fireplace, full kitchen, close to the beach), and invariably plan a stack of projects we want to do while we are away, then pack up the car and go. Sandy Point is perfect – there isn’t much to do there apart from run on the beach (unless you decide to go further afield, to nearby Wilson’s Prom, or Walkerville, or to Foster for groceries), there’s no internet or mobile phone coverage (or so we thought – we discovered we both had full coverage inside the house this year – ‘3’ must have increased their range since last year – and the local cafe has a wireless option now. But fortunately we only found out about that on our last morning!). 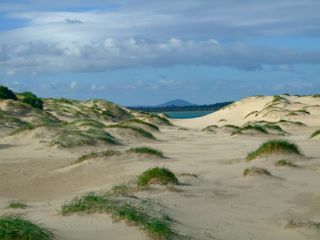 The beach at Sandy is wide and long. 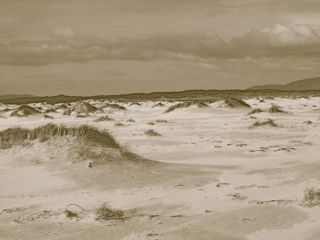 At one end, as the beach widens further into Shallow Inlet, the wind has sculpted the sand there into ornate dunes – folds and points of sand that get whipped up and re-sculpted on a daily basis. 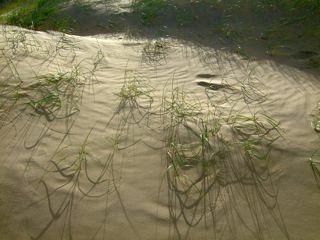 Here are some photos I took on our last morning there, trying to capture the eerie, moon-like sandscape quality. 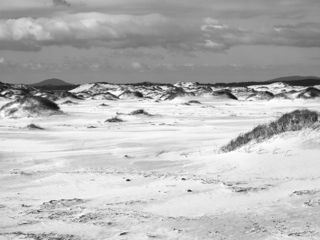 One last project to prepare for before I go off on my one-week holiday to Sandy Point (no mobile phone coverage, no landline, no internet). This weekend is the third gathering of the Signal Art Ensemble, a project I am directing with funds from the City of Melbourne and musicians from the Australian Art Orchestra. With this project we are going to compose music to accompany some extraordinary visual images by the film artist Louise Curham, taking some initial guidance for our music from the compositional overview of SOAK by Alister Spence (being performed by the Art Orchestra later this year). The images are hypnotic – Super 8 film that has been treated and manipulated with imposed animations/scratches (?) over it, and very vivid, rich colours. Also some interesting superimposing of typeface. I think the young people will enjoy working with this material. (There’s a great sample of her work on You Tube, below). It’s my last project at the end of a very full period of projects and performances, but fortunately it is also far less structured than the others. The focus in very much on improvisation and the young people taking part are full of ideas. Musically we might start off with some grounding work in improvisation (in particular ‘finding endings’ in free improvisations, playing in 10/8, and building up some ideas using a range of percussion instruments I shall bring in with me that are all made of metal – some gongs I bought in Cambodia, silver shakers that my mother brought back from Ethiopia for me, and a range of beautifully pitched bells that I bought years ago in Bulgaria. This week started with two days of MSO ArtPlay Ensemble workshops. It is the second time I have worked with this group of children (the third if you count the Open Workshops where I met them all for the first time). In these workshops the same group of 28 children come back every school holidays for 2 days of intensive composing, at the end of which we perform a new work for their parents and anyone else who wants to come along. I choose a piece of MSO repertoire to focus on (a piece that they will be able to go along and hear performed in concert in the weeks following the project) and get the composition started with a few key musical ideas or compositional tools that are featured in the stimulus work. This June project we focused on Rachmaninov’s Symphony no. 2, a mighty piece of orchestral music. I love Rachmaninov. He wears his heart on his sleeve and teases his audience into all sorts of states of tension before releasing them in some glorious way. He also writes some great melodies. tension and release – I examined lots of the build-ups in the score and their subsequent releases and identified kind of formula that Rach uses to first build tension and then to release it. I described this to the kids and we improvised around these ideas using body percussion. Then we spent a bit of time improvising on the opening chords, creating what later become a whole-ensemble opening for our composition. Much of the composing work takes place initially in small groups – 7 young people in each, led by a musician from the MSO. I give the musicians a quote from the score that I’d like them to incorporate in some way (one quote per movement, sometimes two if I can’t resist), and ask them to keep the earlier skills work in mind (eg. sequences, triplets, releases) as their music evolves. At the end of the first day we have a listen to what each group has created. The second day is spent putting the whole piece together, going through the compositions section by section and looking for points that might be enhanced by the whole ensemble joining in, rather than just the group of 7 that composed that specific idea. It means there is a lot of memorising taking place on the second day. With this project in particular, I wished we had another day. Ideally, this would be a 2.5 day project, or even a 3 day project. By the end, we have always created about 15-20 minutes of music… but the extra time would mean we have more time to digest and process all the ideas. It would mean I could involve the children more in some of the structural decisions that need to get made and that we could spend more time refining performance aspects such as intonation, which would make the pieces sound even better. So often, in all sorts of arts and education work, not only that with children, we compromise on things like time and numbers of participants, in order to make the financials work. It would be great to have at least one project a year where you are able to work with ideals – the ideal workshop length, ideal numbers of participant and musicians, in order to demonstrate just what is possible when you aren’t required to work with less-than-ideal restrictions. I am often amazed by the music that emerges in these projects. It can be so beautiful, and so interesting. But I am also aware that the pace of the projects can be a little too intense for some of the participants. It would be great for us all to be able to relax a little bit more – it is a school holiday project after all! This current riff – on ideal project conditions – is something I’ll keep mulling over. The other possibility is that I scale down the project scope… we could do less, create less material, and so have more time to spend on a smaller amount of music. Would this impact on the number of participants? At the moment, I think that the amount of material we create is linked directly to the number of participants and the fact that they all have input into the music – I never decide how long the piece is going to be, it just always turns out to be around the same length once the children start composing. If we set out with the intention to make less music, we’ll need less input, so we’ll either be shutting some voices out, or we’ll be accepting a smaller number of participants. Interesting. We have a program brainstorm coming up at the end of next month – hopefully these issues are some things that we can tease out there. Anyway, I love this project dearly. On the days when I start my planning and starting delving into the scores and recordings, I think how privileged I am to be able to work with this kind of material for my job! I’ve been thinking a bit lately about those opportunities that arise from time to time to play informally with others and how we respond to them. I went through a classical music training. Improvisation and composing came later to me, after I had finished my undergrad studies. I tend to think of myself as someone who was “classically-trained” and know that I have worked at letting go of a lot of rigidity and baggage that can go along with that training. The funny thing is, I told her, despite all the work I do with improvisation, and in encouraging people to play, I too still can feel crippled by exactly the same feelings. I was at a party recently where there were many musicians (quite a contemporary, avant-garde experimental crowd) and after dinner the music started. Tony (my boyfriend) played (brilliantly, as always), the host and his son performed, some other guests (each of whom were electronic music people) performed using various bits of equipment. I had brought my clarinet with me, but when the time came, I shrank away from playing. I surprised myself, but I knew I didn’t want to play. I felt like I needed to have prepared something. I didn’t feel comfortable to just get up and improvise, for some reason, even though I know I could have done that. By contrast, there was another party recently, when Nico and Martin were here from Ireland, and when the music started there you just couldn’t stop me. Someone lent me a saxophone (I hadn’t brought an instrument with me) and I played all night. I passed it to Tony, seeing as he is the resident expert saxophonist, but the mouthpiece/reed set-up was wrong for him and he was happier just jamming on the guitar. We sang, we played, we rolled out as many songs as we all could think of. No shyness or reluctance on my part at all. It was a very different crowd at the second party – people I know very well, whereas at the first party I was a bit of a newcomer to that group – they are Tony’s friends who I am only just getting to know. When he and I discussed this barrier to playing informally he didn’t agree that it was a legacy of a “classical music training”. He had felt similarly reluctant at the second party, he said, as I had at the first, where he knew fewer people and where the music environment was one based around familiar songs. I know heaps of songs – I’ve always sung and been around people who sing – but he doesn’t, and hasn’t. So he felt less comfortable playing, despite being a seasoned, veteran improviser! Therefore, perhaps the ‘barriers’ are set up more in response to the environment or people present, than they are to our training or abilities. However, I do think the “classical music” training does little to prepare musicians to engage informally and spontaneously with their instruments (I am thinking about a comment an MSO player made to me years ago, when I first started running training projects there, that even to play Happy Birthday at a celebratory gathering felt stressful). And it is crazy, in a way, to think there are any barriers for people playing music who already know how to play. There are enough for those who’ve had little experience or exposure! All of these questions are going to be put in a completely new context when I go to East Timor, I suspect. More on that later. 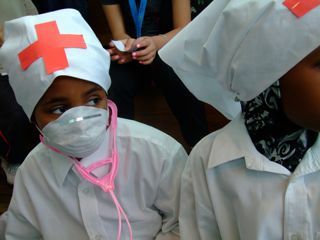 Last week was the last week of term 2, and also Refugee Week. I took all the Language School students to Federation Square to perform in a special children’s concert for Refugee Week. Upper Primary performed very well. They had two instrumental pieces related to stories of leaving countries and making a new home here. I was particularly proud of them – their music was quite complicated, with lots of structures and riffs to be memorised. They did very well. Middle Primary had the most complex instrumental piece of all to perform. They have been ready for performance for a while now – I wondered in fact if we had peaked too early and had been trying not to over-rehearse the piece, which was a series of riffs and melodies gleaned from a Somali pop song that one of the students brought into class. At Federation Square that week, we had a bit of a moment, and it all started to fall apart. The moment occurred when I went to cue the drummer children who were sitting in the back row. 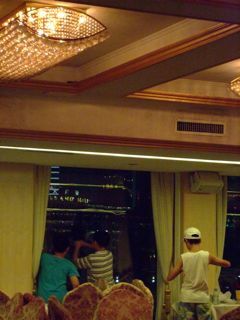 They weren’t looking at me (they were looking out the window in fact! Federation Square is right by the river and the view is admittedly very appealing…). One of the drummers saw just the end of my cue, and panicked and started playing (if she hadn’t seen me, I could have waited to get their attention and do the cue again). So the drums started, then the clave dancers started and unfortunately they all started in the wrong place, in their panic. This got the glockenspiel players in the next row all confused, although they valiantly kept going. The panic meant that nobody was looking at me anymore, so I couldn’t have stopped them (in order to just start again, nice and calmly) even if I’d wanted to – not without making it a very messy stop. 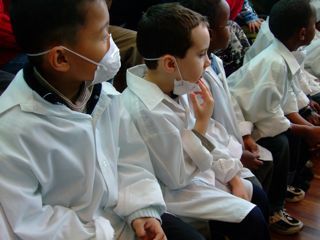 However, what I found really interesting about this whole experience for them was their reaction. It seems odd to say it, but they knew they were out, knew that they had lost the beat and were no longer playing in time with the others. There was a time, earlier this term, where each section would quite happily get the cue to start playing, and put their heads down and play as loudly and quickly as possible, with no clue about how their part needed to fit into the bigger texture. This musical shambles we found ourselves in the middle of, was wonderfully revealing in showing how much they had come to understand the music, even if they weren’t quite ready yet to find their way back when something went wrong. As we left the stage, the drummer girl who had caught the end of my cue came over to me and said, with great concern in her voice, “We weren’t looking. So we didn’t…do… good.” I was impressed by this firstly for the determination she had to speak to me about the performance, despite having very little English, and being a very shy, quiet girl, and secondly because she knew exactly what had happened.This child has only been in the country about 8 weeks. She arrived at the Language School halfway through the term when much of the music had already been learned. It’s quite full-on to come into a creative music environment with no language, expecially when you are quiet and kind of anxious by nature. She worked incredibly hard in music. The following day they performed the same piece again, to a different audience. This time, it came together beautifully. I was very proud of them, and very happy for them. That was my last day at the Language School, at least for a while. I’m not teaching there these next two terms as I am away too much (China, then Sydney, then East Timor… more on those plans later). I’ve been there five years. Very happy years. It’s strange to think I won’t be there next term, and strange to think they won’t feature in this blog. As I write these words that is only just occurring to me. I started this blog to write about the Language School. I will miss it in many ways, I expect. I’ve been privileged to work there.